New York City tech boom: How it became the Silicon Valley of the East. How New York became the Silicon Valley of the East. 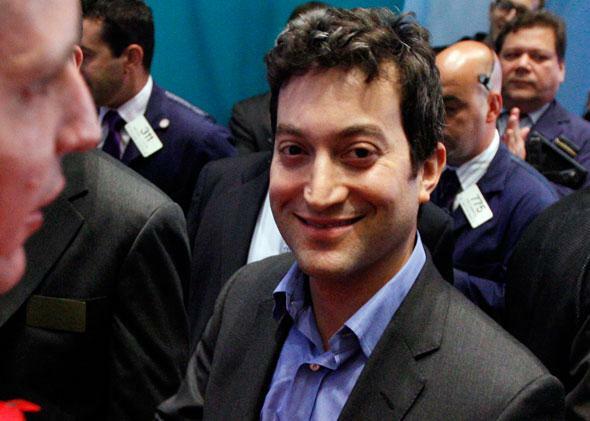 Shutterstock’s Jon Oringer celebrates his company’s initial public offering on the floor of the New York Stock Exchange on Oct. 11, 2012. America’s biggest monthly meeting of techies, entrepreneurs, engineers, and hangers-on around the startup scene is not in Silicon Valley. It’s in Greenwich Village. It’s called the New York Tech Meetup, and tickets sell out within minutes every time they go on sale. The venue is a glossy performing-arts center on the New York University campus that holds 800; stop by on the first Tuesday evening of the month, and you might find people scalping tickets on the sidewalks outside. Inside, the atmosphere borders on raucous: two hours of demos by local startups hoping to hit it big, followed by a beer-slicked networking marathon masquerading as an afterparty. During the event, audience members pepper the startup founders with questions, but one question is out of bounds: “What’s your business model?” Ask it, and boos will rain down from the balcony. Boston, with its proximity to Harvard University and the Massachusetts Institute of Technology, has long been the second city of America’s technology industry, the East Coast’s humble answer to Silicon Valley. In just the past five years, though, the buzz surrounding Boston’s startup scene has been matched—and now, perhaps, surpassed—by what’s unfolding down the coast in New York. It’s a shift few would have expected 10 years ago, when the first New York Tech Meetup drew four people, including the two co-founders. Back then, the city’s tech scene was a punch line. The 1990s dot-com boom in Silicon Valley had been accompanied by an even frothier and less-substantive boomlet in Lower Manhattan, dubbed “Silicon Alley.” When the air went out of the balloon, the Bay Area fell back on its stalwarts—the Oracles, Intels, and HPs—and began to regroup. But in New York, the whole scene just vaporized. Without a top-ranked engineering school or cutting-edge corporate anchors, it seemed like New York simply wasn’t cut out to be a tech hub. Yet as Google and Facebook boomed in the second half of the 2000s, media and advertising began to move online, destroying old business models and birthing new ones. New Yorkers had no choice but to take notice. In 2003, the young entrepreneur Jon Oringer saw a need for cheap stock photography for websites and blogs and founded Shutterstock.com. He seeded the site by snapping 30,000 pictures on his own Canon Rebel in that first year. The same year, Nick Denton launched the blog network Gawker Media from his SoHo apartment. At first, they were like lonely pioneers resettling a wasteland. In an interview last week at his Financial District office, Shutterstock’s Oringer recalled people asking him why on Earth he was building a startup in New York—everyone knew you had to move to Silicon Valley to be successful. Oringer, a Westchester native and graduate of the State University of New York at Stony Brook, replied that he couldn’t fathom living anywhere else. Besides, he reasoned, New York had more advantages as a startup hub than people gave it credit for. It was teeming with young, smart, and hungry workers. Many were multilingual, a plus for any company aiming at a global market. The billionaire entrepreneur Michael Bloomberg, then in his first term as mayor, was bent on reclaiming the city’s cutting-edge mantle. And the proximity of Madison Avenue and the Midtown media empires made it easy for digital-media upstarts to court clients and form partnerships. In a break from his Silicon Alley predecessors, Oringer shunned venture capital, preferring to balance his budget with revenues from the beginning. The early returnees were soon joined by reinforcements. The online crafts marketplace Etsy launched in Brooklyn in 2005, and the following two years brought Manhattan tech-media and online-advertising startups BuzzFeed, Outbrain, AppNexus, Betaworks, and Gilt Groupe. In 2006, Google set up shop in Chelsea with its largest office outside of Silicon Valley, and other Silicon Valley giants followed suit. Venture capitalists began to reopen the Manhattan offices they had shuttered after the 2001 collapse of the original Silicon Alley. 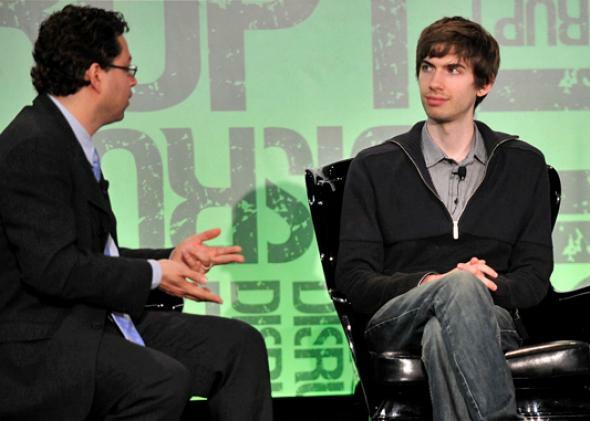 Tumblr’s David Karp (right) is interviewed during TechCrunch Disrupt New York in 2011. By 2007, the New York Tech Meetup boasted 7,000 members and had become the city’s premier venue for startups to demo their new apps and websites. It was at a November 2007 meetup that a 21-year-old named David Karp first gained wide attention for his new blogging platform, Tumblr. Early employee Marco Arment, who went on to found Instapaper, sat in the front row taking pictures. A 2009 demo by Foursquare at the tech meetup was widely credited with building the buzz the location-based network needed to become the biggest hit of South by Southwest when it launched there a few weeks later. If the city’s tech scene lacks a distinct geographic epicenter—there’s no equivalent of San Francisco’s SoMa district in terms of startup density—the meetup has become a de facto ground zero for the city’s startup community. Political candidates now drop in to pitch their credentials, and the Obama and Romney campaigns wrote open letters to the Tech Meetup community, detailing their tech-policy planks. The financial crisis hit Wall Street hard, but it may have only accelerated the city’s growth as a tech hub, as its bottomless pool of ambitious young people turned from investment banking to startups and venture capital to seek their fortunes. In the past five years, the number of startups in the city has multiplied, surpassing the number in Boston, Chicago, Los Angeles, or any of the other American cities sometimes touted as “the next Silicon Valley.” New York Tech Meetup’s unofficial “Made in NYC” list of homegrown Internet companies has 618 and counting, while a tech-company map maintained by Mayor Bloomberg’s office counts 1,434 that are currently hiring. The money has followed: According to CB Insights, venture funding in New York has more than doubled from 149 deals worth a total of $1 billion in 2009 to being on pace for 382 deals worth $2.7 billion in 2013. And New York startups have attracted more venture capital than their Massachusetts counterparts in two of the past three quarters. For all the money flowing in, New York has yet to produce a world-changing tech company on the scale of Google or Facebook. Rather than altering the structure of the Web wholesale, its startups so far have tended to take technologies developed elsewhere and apply them to fresh niches. Many have aimed at industries in which New York was already a leader: Gilt in luxury retail, Fab in fashion and design, Gawker and BuzzFeed and Upworthy in media, AppNexus in online ads. Even as New York startups have outnumbered those from Boston, Boston’s retain more of a reputation for groundbreaking innovation, particularly in the biotech sector. I asked Oringer if he had ever thought seriously about relocating to Silicon Valley, as tech companies the world over tend to do when they reach a certain size. He scoffed. New York has everything a startup needs, he said. On top of that, it’s bigger, more diverse, more dynamic, and far better-served by public transit than the Bay Area. There’s still a shortage of ace engineers, he admitted. But that’s why Bloomberg worked to bring a new tech campus to the city—a joint venture between Cornell University and the Israeli tech institute Technion that’s scheduled to open its doors in 2017. In Slate last week, David Auerbach outlined the recipe for Silicon Valley’s success but doubted that any other city could replicate it anytime soon. He’s probably right: While New York City’s share of U.S. venture funding has grown, Silicon Valley’s shows no sign of slipping. Yet Oringer alluded to an oft-overlooked advantage that New York may hold over Boston, Austin, and all of the other cities angling for a bigger share of the economy’s fastest-growing industry. Tech is one of a few sectors that pay their top talent enough to live anywhere they want, no matter how expensive. And New York is a city where a lot of people, like Oringer, really want to live.